• Research of Reginald Barton of New York concerning the Archibald McFayden family of Cumberland Co.
• Vic Clark Papers, Genealogical Library, NC Dept. of Archives and History. Notes: Around 1940 James Franklin "Frank" McKay of Philadelphus (my great-grandfather) told his granddaughter, Dot Edgerton (my mother), that he had always heard that his gr-gr-grandfather, James McNeill, came from Scotland in 1740. As Frank McKay was not overly interested in local or family history, it is doubtful he was even aware that there had been an Argyll Colony. It would appear, then, that James McNeill was an Argyll Colony child, arriving in America at the age of eight. Was he with parents? If I had to hazard a guess at James's father from the McNeill men of the colony, I would guess Daniel McNeill of Taynish simply because of naming patterns amongst James's sons. Without DNA analysis, it is impossible to know unless records come to light. 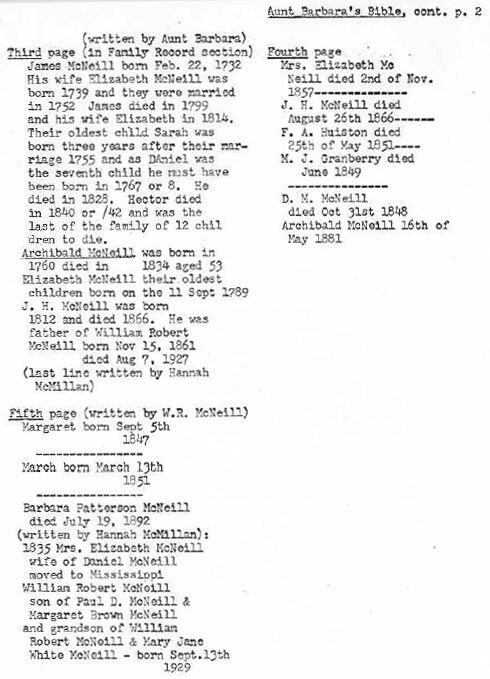 The following children are listed in an order based on bible information (I do not have the original) that James's and Elizabeth's first child was Sarah born 1755 and their seventh child was Daniel born about 1765, Margaret born 1764, with newly acquired information that daughter Anne was born right at 1780. Further info from the 1786 Bladen County tax list shows James's household consisted of 7 daughters and 3 sons for that year. Margaret's birth year is known, 1764, which puts some ten years between Sarah and Margaret, room for some 4 children, probably all daughters (see next paragraph for info on proposed daughter Mary). A bible inscription guesses that Daniel was born about 1767, though his tombstone at Philippi places it nearer 1765. Son Hector's obit stated he was born about 1775. James Jr.'s birth is placed as a 3rd son owing to Scottish naming patterns of the day. Daughters whose names are not yet known are placed approximately 2 years apart to fill the years for which we have no birth dates. Flora McEachern witnessed James's will but is not specifically named as one of his daughters; however, a John McEachern is given 30 dollars, the same amount given by to "each of my daughters" and that is why I have listed her as a possible daughter; it is just as possible and more likely, however, that John and Flora McEachern were neighbors and friends. In a letter dated 1941 from A.C. Bethune of Raeford, the daughter Elizabeth was found mentioned as a sister to Anne who married a McFadyen; Anne's obit was dated 1825 stating her death at around age 45 making her one of the last children born to James and Elizabeth. It is very likely, however, that one or two children have died by 1786. The child Mary McNeill is added below as an educated guess. I have long suspected Malcolm McNeill's wife Mary—her parents have been unknown to the present day—was the daughter of James and Elizabeth McNeill of this chart. I suspect this based on the facts that Mary and Malcolm named their five oldest children Barbara, Archibald, James, Daniel and Elizabeth, matching the old Scots' naming patterns for children that reflected their grandparents' names; all five of these children of Malcolm and Mary's were born between 1778 and 1786 in roughly 2-year intervals leaving little or no room for any children born between their birth years and who may have died. In addition, there was at that time no other James McNeill in the region old enough to be the grandfather and namesake of their son James. A bible record states that Sarah was the first child born to James & Elizabeth after their marriage in 1752. No further information. Second wife of Daniel McEachern, married c. 1774. Her name MAY have been Flora but no proof exists of her first name. Since her first child was born c. 1775, she was likely the 2nd or 3rd daughter born to James & Elizabeth. that stated Nancy McFadyen had a sister Elizabeth. Believed unmarried, but lived with his niece, Ann McNeill Wilkinson of Cumb. Co., wife of William Wilkinson & daughter of "Long Duncan" McNeill.